Was sich im letzten Jahr so alles ereignete, können Sie dem Bericht unseres 1. Vorsitzenden, Robert Tonks, anlässlich der Jahreshauptversammlung 2012 entnehmen. What a surprise party to kick off the new year! Karin Brand had to cancel at short notice due to a bug and consequent lack of voice. Then Steve Tipping, who originally only planned to play the odd song or two, gave us the best unplugged gig to date playing his and our favourites. It was a truly polished performance. Can that guy connect! Everyone, including our guests Barbara (85 years old) from Portskewett/Wales and grand-daughter Carma (29) with partner Coen (24) from Amsterdam and Heinz and Ried (both 66) from Eindhoven had a ball. At our February meeting we were treated to a reading by Neil Dean, lecturer at Uni Duisburg-Essen. Neil presented his new book Rocky Passages which is about how his favourite tunes from four decades of rock music have impacted on his life. We were all delighted to join Neil and take a stroll down memory lane. Please come again Neil! At our March meeting Heinz-Günter Clasen, Radio Duisburg, gave us an insight into the political developments in Duisburg over the eventful last few months. Thanks Heinz-Günter for an excellent run-down and interpretation of the sequence of events. At our 62nd regular meeting on 5 April, Mair and Elena Edmunds Harrington entertained us in two very different yet complementary ways. First, Mair told us some of her favourite “true” stories from her comprehensive repertoire of Welsh and Scottish tales with scary, fairy content. As a friend said, and I quote,“It’s the way you tell ‘em Mair! Great stuff.” Various episodes were rounded off by Mair’s highly accomplished daughter Elena on the deep, “woody” sounding Welsh harp making for a truly Celtic experience. Thanks to you both. You really ought to go on a European tour. Subsequently, Duisburg/US artist Stacy Blatt reported on the initiative of Duisburg artists in the “Mercator Quarter” celebrating the 500th birthday of Gerhard Mercator the most famous Duisburger – him of the Mercator Projection and without whom there would be no satnav. Many thanks Stacy for your very comprehensive impressions in pictures of an unparalleled series of events. Excellent stuff! In May we had two events. At Grammatikoff, on Thursday, 3 May 2012, was our regular meeting at which we planned our fun event in early June, "Queen Live at Duisburg Sports Park" to mark the ER II 60 year-jubilee. 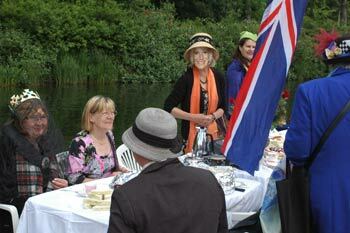 As previously hinted the idea was to have high tea with Her Majesty on a - large and decorated and colourful - raft!?!. So, we had a brain-storming session. On 4 May, Steve, Jani and Anna provided us with their BritRockFolk contribution to this year's "Celebrate Europe" party in Paulus Kirche organised by Verein Gegen Vergessen and several other international organisations including ourselves. This one really was too good to miss, the climax to a great party! The atmosphere in the church was amazing and the Tipping family Steve, Jani and debutant Anne definitely were. Bob filmed the entire show whilst Paddy could not make it as he was spending a year Down Under. If you doubt Siegen has got talent check these guys out. We met at Seehaus, Berta Lake, at the end of May to put finishing touches to our plans for the Royal Tea Party on Board HMS Maid in Germany. 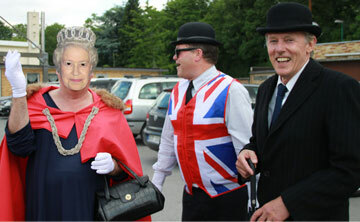 We met at Lindenwirtin on 30 May to chat with Portsmouth Friends about their role in the planned Queen gig. To Chelsea FC fans out there: You have finally done it. Join the club. Bad luck to Bayern Munich. It was just not your season. At the end of May we sent out the following press release in German. einen Tag vor der großen Bootsparade auf der Themse wird Ihre Königliche Hoheit Elizabeth II. das Jubiläums-Spektakel abseits der britischen Presse im Sportpark Duisburg proben. Auf Einladung der Deutsch-Britischen Gesellschaft wird die Monarchin, die auf 60 Jahre Regentschaft zurückblicken kann, am Samstag, 2. Juni 2012, mit ihren Gästen einen entspannten Tag in Duisburg verbringen, um sich auf die größte Flottenparade in London vorzubereiten. Doch ohne Protokoll geht es auch am Tag der Generalprobe nicht: Gegen 11 Uhr wird die Queen und ihre Familie am Verbindungskanal an der Dreieckswiese ein britisch herausgeputztes Floss besteigen und Tee mit Sandwiches zu sich nehmen. In respektvoller Haltung gratulieren ihr Freunde, Politiker, Weggefährten der vergangenen Jahrzehnte aber auch historische Gestalten zum Festtag – darunter Camilla Parker-Bowles, Indira Ghandi, der Erzbischof von Canterbury, Mary Queen of Scots and more. Anschließend nimmt der königliche Tross Kurs auf den Bertasee. Queen Elizabeth wird die Zuschauer am Ufer huldvoll und voller Anmut grüßen und sich – je nach Sicherheitslage – am Wasserspielplatz unter’s Volk mischen. Gäste werden höflichst gebeten, sich respektvoll zu verhalten: Damen knicksen, Herren verbeugen sich leicht, wenn sie von der Königin angesprochen werden! Die Deutsch-Britische Gesellschaft bittet darum, von Versuchen, das Floss zu kapern, Abstand zu nehmen. 1. Treffen zum Aufbau Floß neben Bootshafen Kruppstr. 30 A, 9.00 Uhr, Abfahrt zum Verbindungskanal: 10.30. 2. Pressekonferenz: Ankunft Floß am Steg Verbindungshafen, Kruppstr. 30 B, hinter Tribüne Regattabahn: 11.00 Uhr. Ankunft Queen im Mercedes 170 (Baujahr authentisch: 1952). Queen geht über roten Teppich an Bord Floß, anschließend Pressegespräch. 3. Ab 11.15 Uhr Weiterfahrt über den Bertasee zum Wasserspielplatz. Ankunft Steg Wasserspielplatz 11.30-12.00 Uhr. Ihre Majestät grüßt die Badegäste u. a. dort, die die Gelegenheit haben, an dem eigens für diesen Tag eingerichteten Speakers’ Corner der Queen Ihre Meinung zu sagen. Nach der Generalprobe zieht sich das königliche Floss wieder in den Stichkanal zurück, wo die Jubilarin sich von den Anstrengungen erholen kann. Die Deutsch-Britische Gesellschaft ist bekannt für ihren schrägen, britischen Humor – wen wundert das... Deshalb freuen sich vor allem die britischen Mitglieder, die fernab der Heimat in Duisburg leben, ihrer Königin auf diese Weise eine Freude zu machen. Subsequent to the Queen event we disseminated the following message to the Members and Friends of British-German Club Duisburg and the media around the globe. 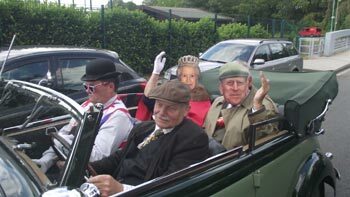 HM Elizabeth II came to Duisburg on the Rhine yesterday for a dress rehearsal for the party on the Thames that was 60 years in the making! There was also a clip on WDR Duisburg Lokalzeit on 2 June 2012 (cf. WDR Lokalzeit Duisburg Mediathek for the next 7 days). A repeat - and a bit more - will be on WDR "Daheim und Unterwegs", Monday, 4 June 2012, 4 p.m. - 6 p.m. Enjoy (I know we did). P.S. Weren't we lucky with the weather. You never walk alone !!! 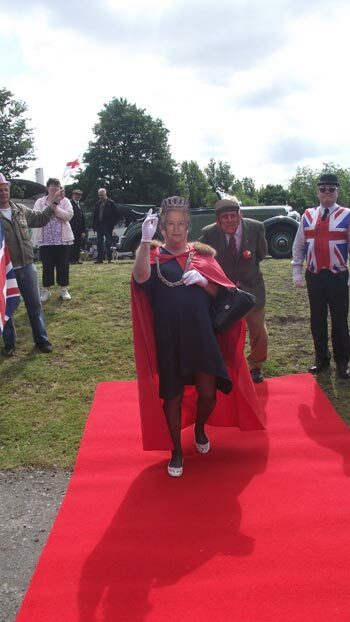 Our Queen live happening on the Royal Raft HMS Maid in Germany was quite an event in Duisburg last weekend. Photos and videos of our Duisburg event have been identified all over the globe, in London, Washington, on Tonga and the Philpines. WDR Lokalzeit Duisburg had it as did WDR Daheim und Unterwegs, RP, WAZ, NRZ and many more. Please feel free to search for links we can post on our wesite. Bob, Her Majesty, and Iris, Emma Peel, have collected over twenty already. 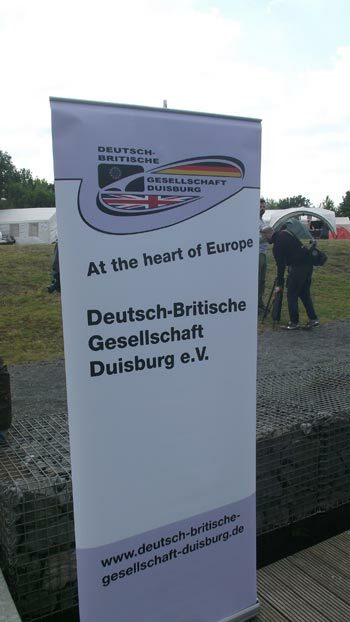 To see two videos go to "www.deutsch-britische-gesellschaft-duisburg.de". Then click on Queen Live. There you will see the WDR link and a picture link to the video on Youtube. 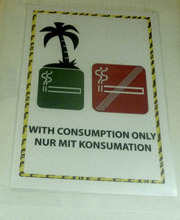 We meet at Grammatikoff, Dellplatz 47051 Duisburg-Mitte, 7 p.m. on 14 june 2012 to enjoy the highlights once more. Bring your pictures for the big screen. IMPORTANT CHANGE OF VENUE THIS THURSDAY: We meet at Steinbruch!! !, Lotharstr. 318-320, 47057 Duisburg, Thursday 14 June 2012, 7 p.m. Please tell all those concerned. Jürgen Hordt, please also inform the Portsmouthfreunde. In the media Our Queen Live Fun Event literally went around the world. This is just a selection of the links. 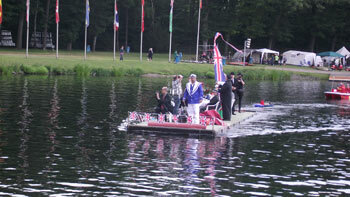 Pictures and video clips of our fun event on the Royal Raft HMS Maid in Germany in Sportpark Duisburg on 2 June 2012 to mark Queen Elizabeth II 60th Jubilee went around the world. Having shown the initial media highlights available in June we presented an equally entertaining selection collected by members and friends at our regular meeting in July. 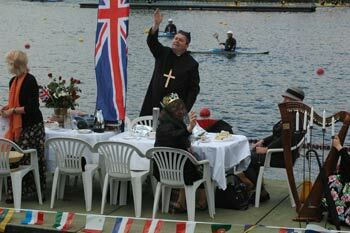 The 2012 Olympic Games in London got off to a wonderful start with a bumper portion of British eccentrics reflecting on our British past, present and future. The Queen as Bond girl, I ask you. In hindsight, the opening ceremony in London put our fun event on the Royal Raft HMS Maid in Germany in Sportpark Duisburg to mark Queen Elizabeth II 60th Jubilee in the perfect perspective. Bob as the Queen saved from the clutches of Nessie by John Steed? Whyever not? Having shown the initial media highlights available in June, we presented an equally entertaining selection collected by members and friends at our July meeting. By the way, the enthusiastic responses just keep coming! At our August meeting we chatted at length about activities for 2013. Some interesting ideas were put forward, including a pancake race on Shrove Tuesday and a Schimanski/Holmes skit. Duisburger Klaus Riede, volunteer Games Maker at the 2012 London Olympics, reported on his fortnight of exciting work in the capital. Numerous photos prove that he really was the man for the job. Thank you very much Klaus and your wife for an interesting evening at our September meeting that seemed to be over in next to no time! The Krefeld „Open Air Proms Concert“ in the frame of British Days + Country Fair took place at its customary venue on the green at the centre of the idyllic Linn Castle for the fifteenth time on Saturday, 8. September 2012. To add to the atmosphere the concert always starts at dusk and always seems to be lucky with the weather and 2012 was no exception. This year, again, we set a new record with – as the evening’s moderator emphasized to an audience of approximately a thousand - seventy (!!!) people joining the Duisburg table as opposed to fifty in 2011. Rob Tonks presented his second book „Denglisch in Pool Position – English makes German Werbung funny! 2“ in Duisburg central municipal library on 12 November 2012. Rob donated the proceeds from the 100 paying guests at this premiere to the library foundation in the frame of the book patrons project. The funds will be used to extend the children’s inter-cultural section. Remember remember the 15th(?1?) of November. Due to important commitments – Bob Clark’s sixty-fifth birthday - our November meeting took place on Thursday 15 November 2012. The idea was to have our traditional - if somewhat belated - Guy Fawkes Bonfire Night in connection with an outdoor birthday party for Bob. Lilly and Robert Junior did a great job of keeping it a secret. Bob was amazed. 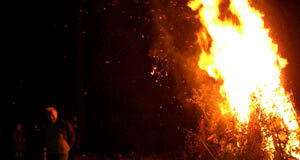 But then how often do you get fireworks and the best bonfire this side of the English Channel for a birthday present? Our annual general meeting took place at Grammatikoff, at 7 p.m., on 6 December 2012. To get us all in the mood for the festive season Karin Brandt sang some Xmas carols in German and English. 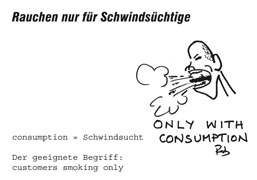 Finally, Rob presented „Denglisch in Pool Position – English makes German Werbung funny! 2“ in Cafe Kaldi, otherwise known as „Schimanskis pub“, after the famous Duisburg TV crime detective Horst Schimanski, on 19 December. Rob donated the proceedings of approx. 60 paying guests plus his fee to „Pro Kids“, the Duisburg institution for homeless young people.